The Cross Alert System is a motion activated, solar powered, radio controlled early warning system. 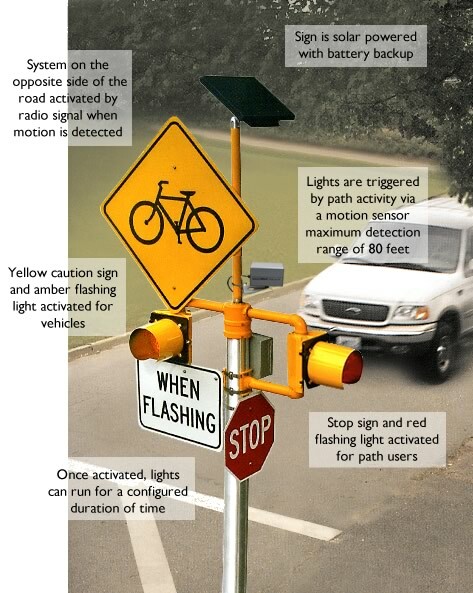 The Cross Alert system consists of an 8" red LED beacon and a stop sign which are presented to path users and a 12" amber LED beacon and warning sign which are presented to vehicular traffic. The device is powered by a solar panel, which is backed up by a battery. The system is activated by path activity via a microwave-based motion detector. The companion device on the other side of the road is activated via radio signal when the first device detects motion on the path. This system includes an integrated trail counter to provide a count of trail users who cross the intersection. Optional push buttons can be used for device activation as well. All signage in our systems comply with MUTCD specifications. Solar power significantly reduces installation costs for the system, eliminating the need for connection to the power grid. Radio linkage between signs eliminates the need for hanging or burying wires. Our systems are capable of running in a configuration with up to four sign poles, all of which can be triggered together by path activity. This configuration provides for amber warning lights to be presented to oncoming vehicles up to 500 feet from the intersection. The Cross Alert System can be purchased and installed at a fraction of the cost of a typical cross walk signaling system.